For the larger red marble, see Crystallized Telepathy. The Omniscient Sphere (思考結晶IKARI?) 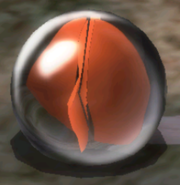 is a treasure in Pikmin 2, and is actually an orange-red cat's eye marble. This treasure is found on the fourth sublevel of the Frontier Cavern. The player needs to deal with the Snitchbugs before trying to move this marble, and be wary of the Bumbling Snitchbug that will drop from the ceiling when the treasure is picked up. The Omniscient Sphere being analyzed by the Hocotate ship. A real world orange marble. This page was last edited on February 28, 2019, at 15:39.